Wärtsilä says it now offer an upgraded version of the its LNGPac, a fully integrated fuel gas handling system, and improvements to the coveted Wärtsilä Gas Valve Unit (GVU). Wärtsilä introduced the LNGPac in 2010. It comprises a complete system for LNG fuel handling, which when introduced included the bunkering station, the LNG tank and Tank Connection Space with the required process equipment, the heating media skid, and the control and monitoring system. It is a unique system that has proven to be a valuable enabler of LNG fuel for marine applications with more than 20 LNGPac systems in operation or under construction. By upgrading the system into a more compact and technically advanced version, safety and reliability will be enhanced, while the capital and operating expenditures (CAPEX & OPEX) will be reduced. The new system has fewer moving parts, and therefore less maintenance is required. Furthermore, the compact design and advanced integration of components makes installation at the shipyard faster and easier. This development has been made possible thanks to Wärtsilä's unique position and comprehensive in-house knowledge of all key components of the vessel's machinery, fuel gas handling system and ship design. The heating media skid, used to evaporate LNG for pressurising the storage tank and to provide the engine with the correct gas temperature, has now been removed as have the pumps. In looking beyond the fuel gas system, Wärtsilä has demonstrated its ability to integrate multiple interfaces within the LNGPac. The new LNGPac directly utilises the engine's cooling water, which results in fewer interfaces and less installation work for the shipyard. By eliminating electrical consumers, Wärtsilä enables the vessel to become even more environmentally friendly. A similar improvement is made to Wärtsilä's Cold Recovery solution, which enables the cold energy of the LNG to be utilized by the ship's HVAC-system. 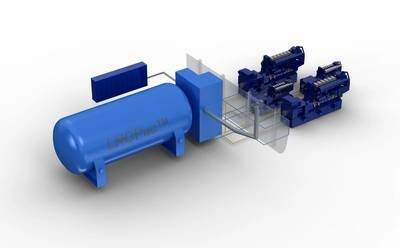 In the new Cold Recovery system Wärtsilä directly connects the ship's HVAC (or other refrigeration systems) to the Tank Connection Space, thus removing a complete circuit consisting of heat exchangers, valves and pumps. The Wärtsilä GVU is a module located between the LNG storage system and the dual-fuel (DF) engine. It is used to regulate the gas pressure and ensure a safe disconnect of the gas system should that be necessary. By combining the LNGPac and the GVU into a single, fully integrated system, considerable space can be saved and a simple 'plug and play' solution will save installation time and costs for the yard. New solutions have been applied to almost every aspect of the new, compact and easy to install fuel gas system. These include an integrated airlock and control cabinet, a more compact bunkering station, an enclosed or integrated gas valve unit, and maximised LNG storage volume. Several of the features have been patented by Wärtsilä. Wärtsilä add that the upgraded LNGPac system will be officially launched during the ONS 2014 conference and exhibition being held in Stavanger, Norway from August 25 to 28. Wärtsilä experts will be on hand at stand number K115 to further explain the benefits of these latest innovations. The new LNGPac will also be featured at the SMM 2014 exhibition being held in Hamburg from September 9 to 12, stand 305 in Hall A4.